Kay Hian can trace its history back to the early 1900s as Kay Hian & Co (Pte), a commodities and securities dealer which subsequently became a founder member of the Singapore Stockbrokers' Association, the forerunner of today's SGX. It acted as an agency broker, primarily in Singapore and Malaysia securities. Kay Hian Hldgs Ltd was incorporated in Singapore on 1 August 1990 as an investment holding company and in October of that year issued 25 percent of its equity to the public. In 1989, James Capel (a subsidiary of the HSBC group) merged its stockbroking activities with Kay Hian to form the Kay Hian James Capel Hldgs Ltd. It became Kay Hian Hldgs Ltd in 1996 when James Capel's holding in the Group was reduced to less than 5 percent. Following the merger of Kay Hian Hldgs Ltd, UOB Securities and the United Overseas Bank Ltd Group's overseas stockbroking interests, UOB-Kay Hian Hldgs was formed and listed on the SGX-ST on 23 October 2000. At the same time, Kay Hian Hldgs Ltd was delisted. 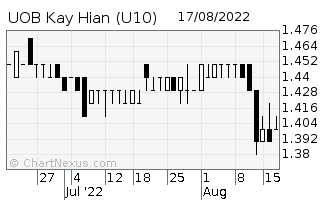 Its subsidiary, UOB Kay Hian Pte Ltd is an amalgamation of eight stockbroking houses, namely, Kay Hian, UOB Securities, RHB-Cathay Securities, OUB Securities, Grand Orient Securities, J M Sassoon, Millennium Securities and the retail arm of Credit Suisse First Boston. As part of the UOB Group, it is able to tap on the Group’s competitive strengths to cross-sell its products. It has broadened its business activities to cover fund management, unit trust, derivatives trading and corporate finance. To capitalize on the emerging opportunities in Asia, it has established offices spanning the region including Bangkok, Hong Kong, Kuala Lumpur and Shanghai besides the HQ in Singapore. It acquired BNP Paribas’ Thai retail operations in late 2001 with the objective of building a strong stockbroking and financial services arm in Thailand. The acquisition of Worldsec Intl, a Hong Kong-based brokerage house, position the Group well for the Chinese equity market. To enhance its institutional sales capability, it has also established sales offices in key global financial centres in New York and London.